Nine times more protein than yogurt. If research pans out, it’s possible that the moringa tree (also known as the drumstick tree) and its seeds will become a new superfood. The following are some of the health benefits associated with moringa seeds. More research is happening every year on the medicinal value of moringa; we have only just begun to understand how potentially powerful moringa tree seeds are. 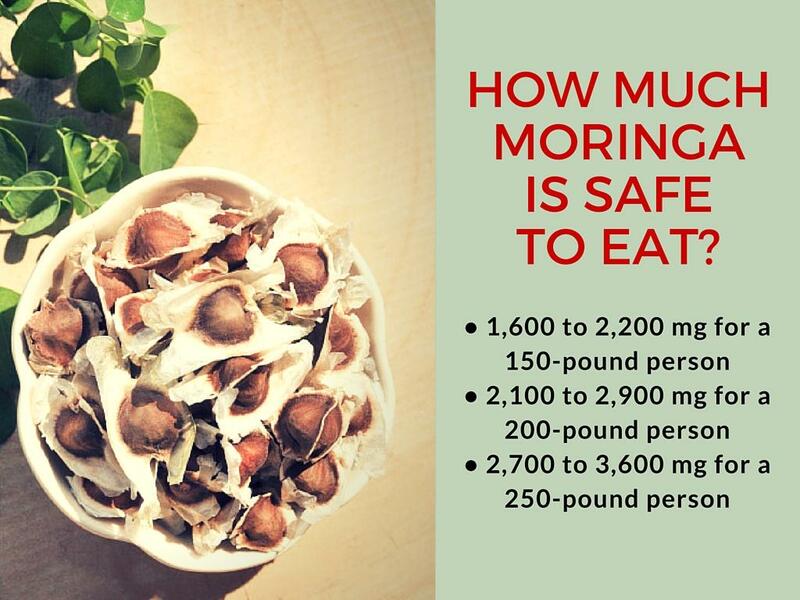 What is moringa seeds’ nutritional value? The following table is a breakdown of the nutritional information for moringa seeds, per 100 grams. Two key things to note are that these seeds have zero cholesterol and are very high in fiber, which can make them beneficial to a healthy food regimen. Oleic acid works to reduce the amount of lipids in the blood. Another valuable benefit of moringa seeds is their reported ability to help you sleep and prevent insomnia. The oil extracted from moringa seeds is what is thought to stimulate sleep by inducing hormones. As a rich source of the amino acid tryptophan, moringa seeds benefit neurotransmitter function, and this helps you also fight fatigue and insomnia. A single serving of moringa has almost three times the amount of iron as spinach. This is especially important for vegetarians/vegans and those who suffer from low-iron issues, as the body needs iron to enrich the blood and carry oxygen to our muscles, organs, and tissues. There are also benefits of moringa seeds for diabetes and blood sugar regulation. Several studies have found that moringa seeds may reduce blood sugar levels. The scientists believe that the blood sugar-lowering effect is due to compounds like isothiocyanates. Some small studies have been done on humans, however. Too much cholesterol in the blood has been linked to heart disease. In traditional Thai medicine, moringa is used as a cardiotonic (a drug or herb used to improve how the heart contracts). The oil can be used as a moisturizer and antiseptic as well. The omega-9 fatty acid in moringa seeds is thought to also be one of the best natural moisturizers for the skin. In addition, moringa seeds contain collagen, which helps prevent acne and reduce skin wrinkles. It is no wonder that moringa seed oil has a lot of value in the cosmetic and beauty industry, and it can be found in body oils, deodorants, hair products, soaps, body washes, anti-aging creams, and massages and aromatherapy oils. Moringa seeds can also help treat digestive and colon problems, and they’re particularly useful for soothing peptic or gastric ulcers. Ulcerative colitis is a type of inflammatory bowel disease that causes long-term inflammation and ulcers in the digestive tract. Symptoms also include rectal pain and bleeding, diarrhea, and urgency to discharge a stool. Other studies report that moringa seeds help reduce inflammation and provide relief from chronic inflammatory diseases. Research also points to the oleic acid in moringa seeds as having an important role in treating inflammatory pain conditions. Anaphylaxis is a severe allergic reaction that needs to be treated right away, or it can lead to death. Symptoms will include shortness of breath, an itchy rash, tongue or throat swelling, lightheadedness, and vomiting. Moringa seed extract also has antibacterial, antimicrobial, and antifungal properties, which can help treat and prevent infections caused by bacteria, viruses, and fungi. About one in eight women in the U.S. will develop breast cancer over their lifetime. Moringa seeds are high in iron—a mineral responsible for red blood cell maintenance. Iron deficiency will also lead to anemia. Symptoms include weakness, fatigue, pale skin, dizziness, chest pain, shortness of breath, and an irregular heartbeat. 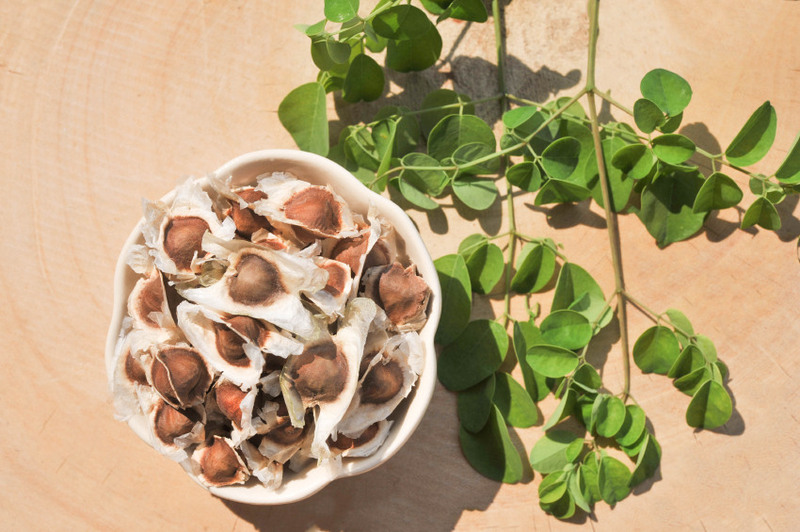 Perhaps unsurprisingly, due to the aforementioned benefits, moringa seed has been found to reduce inflammation, which is linked with many chronic conditions such as cancer, arthritis, and heart disease. Some test-tube and animal studies have supported isothiocyanates as the main anti-inflammatory compounds in moringa seeds. The antioxidant content in moringa seed may also offer protection against liver damage and promote liver health overall. The anti-inflammatory and antispasmodic effects of moringa seeds can help alleviate the severity and frequency of symptoms associated with bronchial asthma. Common asthma symptoms include wheezing, coughing, chest tightness, and shortness of breath. Seasonal allergies will often trigger asthma symptoms. Many parts of the moringa plant are edible, but how to eat moringa seeds, that’s the question. The pods (28) are often used in cooking (though you won’t likely have a chance to have moringa in this form in North America at the moment unless you grow your own tree). The leaves are used more readily. Moringa oil, also called ben oil because of the high levels of behenic acid in it, is pressed from the seeds. It can be used in cosmetics and is edible, though the price is steep; it’s almost 15 times higher than olive oil. The roots are often ground down for use in supplement capsules. Traditional medicine uses the roots, leaves, and seeds. If you do get your hands on moringa leaves (and they will be dried unless you decide to plant your own tree), they can be cooked much like spinach and kale. Add them to a grilled cheese or any other sandwich for a nutrient boost, or use them in soups and stews. The leaves have high levels of vitamins C, A, and B. What about eating moringa seeds raw? The seeds can be eaten just like nuts, so add them to granola or a trail mix you prepare with other nuts and dried fruit. Mix them with hemp seeds for an incredible boost of energy and health. If you can get a hold of fresh seeds, you can boil them as you would peas and use them as a side dish to any meal. The seeds don’t have as many vitamins and minerals as the leaves do, but they are high in vitamin C.
If you opt for moringa leaf powder, you have more options for use. Add the powder to yogurt, soups, and smoothies. You also likely want to know how many moringa seeds to eat. Because it’s relatively new to North American culture, moringa seeds dosages have not truly been established as of yet, but below is a rough guideline. If you are concerned or want more concrete dosage suggestions, talk to someone at a health food store or visit a naturopathic doctor. How long does it take to feel the effects of moringa? Use the above as guidelines for maximum dosages; start at the lowest amount and then work your way up once you determine how your body reacts to it. More research is needed to know the full range of benefits of moringa seeds and side effects. Not enough research has been done to make any known just yet. Use caution and if anything odd does happen, stop using moringa and see a doctor. And if you start experiencing abnormal side effects such as hives, a severe rash, heart palpitations, dizziness, or signs of anaphylaxis, please seek medical help immediately.